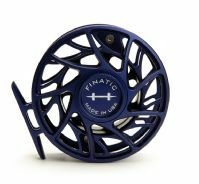 Incorporating all the evolutionary DESIGN FEATURES of the Gen 2 Finatic, we have created a special Custom anodized reel series available in Bluewater Blue for a limited time at select Hatch Authorized Dealers. We will be offering the 3 Plus through the 11 Plus Finatic Gen 2 in Bluewater with light grey paint fill. These reels will be offered in the Large and Mid Arbor configuration. No extra spools available.